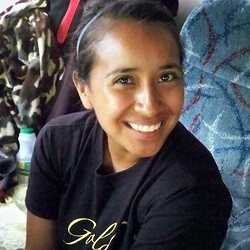 Emily Baeza, 19 Whittier College Gold Trumpet, three years How did you choose your corps? I had never heard of drum corps until my high school band director suggested I check out the shows when DCI was on ESPN. It was love at first sight. I asked around to see how I could get involved and found Gold through some friends. I went to a rehearsal and was immediately attracted to the desire and drive of the corps staff and members. Love for my corps family and the thrill of the competition keeps me coming back. What was the experience like the first time you auditioned for a corps? I was extremely nervous and absolutely scared! I was section leader all through high school, but this was a whole new game. There was an overwhelming sense of experience around me that really shook my confidence, but I stayed true to my heart and gave everything I could to show them I wanted this. What's the best way to prepare for an audition? I would advise anyone auditioning to think of it as a job interview. You should be really professional about the process and be knowledgeable about what you are going to present to the staff. Aside from practicing the material, you need to practice auditioning. Don't be afraid to let others listen and critique you beforehand. Know that you only have a limited time to show the staff what you've got, so don't throw it away with nerves. What would you say to someone who is unsure whether or not to audition for a drum corps? Always go for it! What have you got to lose? You can't put a price on your dreams, especially those with an age limit! My friends and I have dealt with issues about money, school, jobs, etc. but nothing is too tough to conquer if your heart is in it. If you make the corps, it will have long-term positive effects on your life. So avoid regret and get out there! Any other advice? Let's face it. Auditions can be scary. But you can actually use this fear to your advantage. I came into my audition scared of losing the chance to march. You can make the choice to use this fear as the influence that drives you to be at your best. My fear kept me focused and determined with my whole heart in the activity. I mention heart, because drum corps is love, and you can't have one without the other. Never underestimate the power of sun block, camaraderie and heart. Learn more about corps audition dates, locations and additional info.